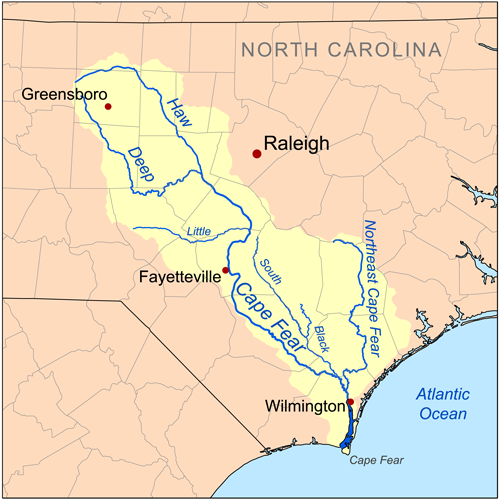 The Haw River flows 110 miles from its headwaters in the north-central Piedmont region of North Carolina to the Cape Fear River just below Jordan Lake Reservoir. The river and its watershed provide drinking water to nearly one million people living in and around the cities of Greensboro, Burlington, Chapel Hill, Cary, and Durham. This 1700 square mile watershed is home to a variety of fish and wildlife, including blue heron, bald eagle, beaver, deer, otter, largemouth and smallmouth bass, bowfin, crappie, carp, and bluegill. The Haw also contains important habitat for the endangered Cape Fear shiner and an assortment of rare freshwater mussel species. 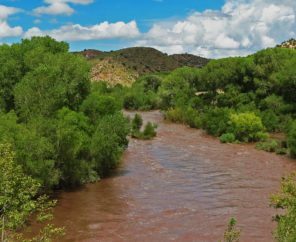 Local residents appreciate the Haw for its outdoor recreational opportunities, including hiking, paddling, swimming, fishing, picnicking, as well as the solitude and quiet the river offers. The Haw River is the most popular whitewater paddling river in the North Carolina Piedmont Region, and Jordan Lake (a 14,000 acre reservoir) provides recreation for about 1 million visitors a year for boating, swimming, camping, and fishing. The Haw River has been the victim of death by a million cuts. Millions of gallons of wastewater and polluted runoff (i.e., rainwater that picks up pollution as it flows over roads and parking lots) have washed into the Haw. Population growth since the 1960s has overwhelmed the systems put in place to protect clean water. Aging pipes and infrastructure have resulted in raw sewage spills of millions more gallons, including the 3.5 million gallon spill in Burlington this year. This pollution, containing excess nitrogen and phosphorous, has caused large algal blooms in Jordan Lake, a major drinking water reservoir, which impacts the health of people and fish. North Carolina was required to develop a clean-up plan by the U.S. Environmental Protection Agency (EPA) under the Clean Water Act to address the pollution problem in the Haw. This clean-up plan developed by the state in 2009— commonly known as the Jordan Lake Rules— requires communities to upgrade their wastewater systems to today’s standards, limit or eliminate new sources of polluted runoff, and reduce polluted runoff from existing development over a long and reasonable timetable. Unfortunately, the cleanup of the Haw River has never been given a chance to succeed. The NC General Assembly has passed laws delaying and weakening the cleanup plan causing the clean water problems to worsen for communities across the watershed. Most recently, an effort by developers and some municipalities within the upper watershed has resulted in the stalling of the cleanup plan in order to carry out an unjustified experiment that would put 36 huge “mixers” into the Jordan Lake Reservoir in an attempt to avoid treatment of the causes of pollution. These mixers will be a hazard to boaters and wildlife that come in contact with them. This experimental strategy is only a cosmetic fix doing nothing to remove the pollutants from the water and ignores the scientific data underpinning the cleanup plan developed in 2009. Worse, it means that the polluted water would just be passed on down the river into the Cape Fear for downstream communities to deal with.